Flooring is an extremely important consideration in a bathroom remodeling project, and many homeowners are getting away from the traditional natural stone and tile and opting for engineered hardwoods. These floor coverings offer the aesthetics of hardwoods with improved moisture retention, but adapting them to your interior design scheme might be tricky. Hardwood flooring can combine with countless color palettes, but it comes down to the finish of the flooring. If you're using a standard brown or tan hue, combine it with a rustic aesthetic. Wicker baskets, scented candles and a demure color scheme will allow the flooring to be the star of your space. On the other hand, you can also use hardwoods as the basis for a modern arrangement. Gray flooring has become extremely popular, and it can provide a bit of contrast in a space with a wooden bathroom vanity, copper faucets and an elegant vessel sink. Flooring can make a huge impact in the look and feel of your washroom, and wood varieties are gaining traction in many design circles. 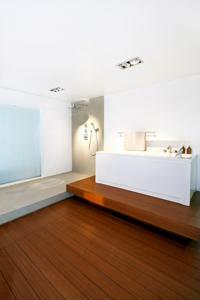 How would you use wood flooring to improve the look of your bathroom?